Beulah the elephant has been unethically exploited and abused by Commerford and Sons for 20 years! She is about 47 years old and should be given the respect to live the rest of her life in peace with other elephants at a sanctuary. Elephants are very intelligent and social animals; they should not be humiliated and forced to give rides to people. This is just WRONG! Commerford and Sons has a long history of abusing their animals at their zoo. They also have been known to use bullhooks on Beulah. A bullhook has sharpened points that are used by trainers to poke and prod into an elephant's sensitive skin, coercing them through intimidation to do things that are entirely unnatural. Even outside circus settings, such as State Fairs, elephants are kept fearfully obedient with bullhooks, something no intelligent creature should be subjected to. There is nothing fun or amusing about exploiting animals. Elephants that are forced to perform in zoos, circuses, and fairs are routinely subjected to intimidation and abuse at the hands of their keepers. Beulah deserves better than this! Please sign this petition to demand that Commerford and Sons send Beulah to a sanctuary. *** You can also contact COMMERFORD AND SONS at (860) 491-3421, and demand that Beulah be sent to a Sanctuary. Retire Beulah the Elephant to an elephant sanctuary, so that she can live the rest of her life with respect and in a social atmosphere with other elephants. Exploitation of any animal is cruel and unethical! I still haven't gotten any responses from the targets of this petition. This November a new Governor will be elected in the State of Connecticut. I will reach out to the office of the new Governor, once he is elected, and bring the issue of sending Beulah to a reputable sanctuary to him. I will close this petition for now, and reopen another soon. The Meadowlands State Fair blocked me from any posts, BUT I did private message a recent fair goer and this was her response ... "Wow I knew those animals were suffering ...that Elephant looked too depressed and did not want to give any child a ride." Please, if you can, go to YELP and give them a 1 star review, as I just did. if more people are aware of the abuse, maybe next year things will change. Thank you very, very much for all of your support !! Good News !!! 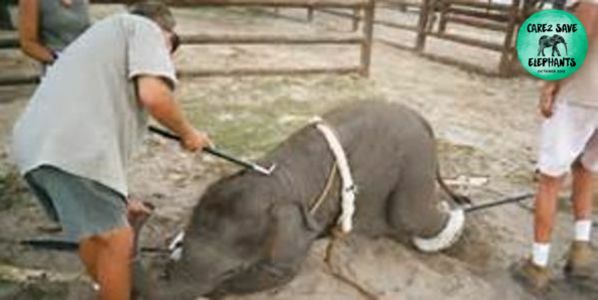 PETA has just posted a TAKE ACTION against Commerford and Sons, and the Meadowlands State Fair to end this abuse !!!! Please sign PETA's petition. Click on the link below and this will direct you to the PETA TAKE ACTION site. Thank You very, very much for all of your support ! I e-mailed the petition to the targets of this petition this morning. I will keep you updated, as I get responses. Thanks again for all of your support, in trying to get Beulah to a sanctuary where she can finally get the respect and dignity that she deserves.